These charms can also be riveted or glued in place. Metamorphosis! 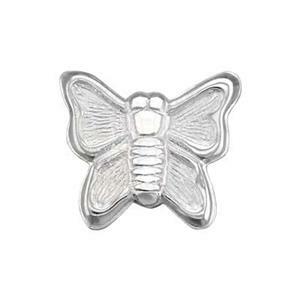 Transform your Jewelry creations with this bright sterling silver butterfly solder ornament. Our line of solder ornaments are perfect to use on hand stamped pieces, flat cuff blanks, or anywhere else that you can use a small embellishment. They can be soldered, riveted or glued in place. We have solder ornaments in 14Kt gold, gold-filled and sterling silver. Find them in under soldering supplies. Notes: Textured and Slightly Convex.